The (backbone, BACKBONE) area interconnects with all other OSPF area types. OSPF type 2 LSA messages are only generated by the (DR) router to advertise routes in multiaccess networks. What is one advantage of using multiarea OSPF? It improves the routing efficiency by reducing the routing table and link-state update overhead. It enables multiple routing protocols to be running in a large network. It increases the routing performance by dividing the neighbor table into separate smaller ones. It allows OSPFv2 and OSPFv3 to be running together. An ABR in a multiarea OSPF network receives LSAs from its neighbor that identify the neighbor as an ASBR with learned external networks from the Internet. Which LSA type would the ABR send to other areas to identify the ASBR, so that internal traffic that is destined for the Internet will be sent through the ASBR? An ASBR generates type (5) LSAs for each of its external routes and floods them into the area that it is connected to. Which command can be used to verify the contents of the LSDB in an OSPF area? Which statement describes a multiarea OSPF network? It has a core backbone area with other areas connected to the backbone area. It has multiple routers that run multiple routing protocols simultaneously, and each protocol consists of an area. It consists of multiple network areas that are daisy-chained together. It requires a three-layer hierarchical network design approach. Where can interarea route summarization be performed in an OSPF network? What is preventing users who are connected to router R2 from accessing resources located either within the network 192.168.1.0 or the internet? The router R2 is not receiving any updates from either router R1 or R3. The default route is not redistributed correctly from the router R1 by OSPF. The interface that is connected to the ISP is down. The OSPF network statements are misconfigured on one of the routers. A network administrator is implementing OSPF in a portion of the network and must ensure that only specific routes are advertised via OSPF. 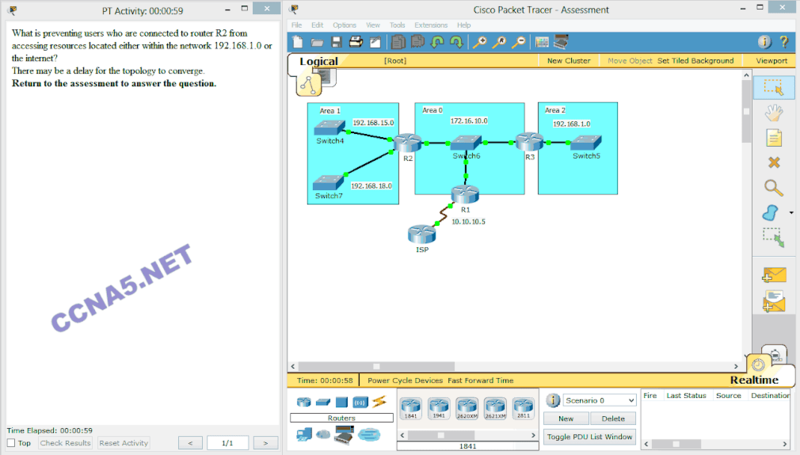 Which network statement would configure the OSPF process for networks 192.168.4.0, 192.168.5.0, 192.168.6.0, and 192.168.7.0, now located in the backbone area, and inject them into the OSPF domain? 23. What routing table descriptor is used to identify OSPF summary networks that originate from an ABR? 24. What is used to facilitate hierarchical routing in OSPF? 25. What type of OSPF LSA is originated by ASBR routers to advertise external routes? 26. What OSPF LSA type is used to inform routers of the router ID of the DR in each multiaccess network in an OSPF area? 27. Why do OSPF serial interfaces usually require manual bandwidth configuration? After attempting to enter the configuration that is shown in router RTA, an administrator receives an error and users on VLAN 20 report that they are unable to reach users on VLAN 30. What is causing the problem? A network administrator has been asked to summarize the networks shown in the exhibit as part of a multiarea OSPF implementation. All addresses are using a subnet mask of 255.255.255.0. What is the correct summarization for these eight networks?